Requirements: EyeTV USB/200/300/400/410, VLC 0.5.3, Mac OS X 10.2.5, network connection. Here in the UK live approximately 60 million people. Coincidentally, the area of the UK is roughly 60 million acres. Some of the land is uninhabited islands; other parts are left as wildlife sanctuaries or for military use only. Nevertheless, there should still be enough land to spread around us Brits so we have nearly an acre each. Luckily, an acre is about the maximum my wireless network can reach with the excellent CyTV streaming software devised by Andreas Junghans. With it, I can stride around my patch of Britain, carrying my laptop and watching live TV. This is ideal for catching Formula One Grand Prix races while stoking up the barbecue. Andreas designed CyTV to send TV signals over a wired or wireless network from ElGato’s EyeTV devices and compatible TV tuners. CyTV can stream live TV and record it at the same time. It lets the receiving computer change channels; pause TV; and configure volume, picture aspect, and quality. 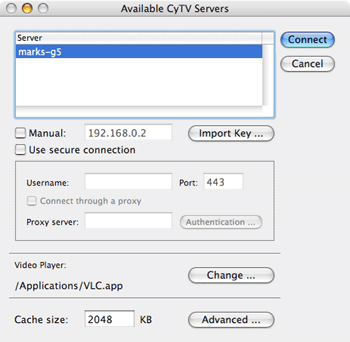 CyTV can even stream pre-recorded TV or films stored on the server computer, with far fewer problems than trying to use QuickTime and the Finder. It is also possible, although I have never tried, to send TV over the Internet with complete security for the serving computer. On its own, CyTV does nothing, it must have the TV signal from the EyeTV receiver and VLC (Videolan Client software). The serving computer, the one connected to the EyeTV unit, needs Mac OSX 10.2.5 or later, the BSD sub-system, Safari 1.0, and EyeTV 1.2, plus the CyTV server software. The client computer at the other end of the network can be non-Mac (CyTV is available for Windows and Linux) and runs the VLC and the CyTV client applications. The advantage of using a Mac is that all the stop/start, recording, and channel-changing facilities are easily available through a point and click interface. Otherwise these have to be done via a Java-enabled Web browser. Security aspects are well covered. 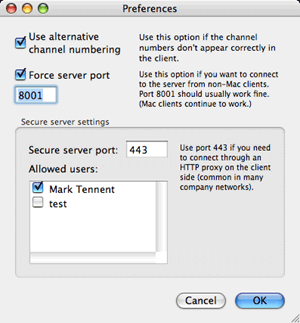 CyTV server has the option to force a specific port to be used (usually 8001), which makes it easy to open the right port in Mac OSX built-in Firewall. For a secure server, port 443 can be set if the client computer has to connect through an HTTP proxy, which apparently is common in company networks. For extra security, CyTV users can be listed individually as well. Installing CyTV is simply a matter of downloading the disk image and dragging the component applications to the server and client computers. VLC is similarly a one-part application. All three run straight out the disc image with a minimum of tweaking. If the client computer dates from within the last three years, the only configuration necessary is to point CyTV’s client application preferences at the hard disk location of VLC, open the stream, and start watching. I have found that the actual requirements of the client and server computers are low. My original EyeTV USB unit needed both to be G3s with an 802.11b wireless network. 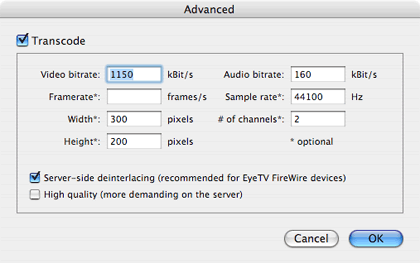 More recent versions of EyeTV tuners have higher resolution and FireWire connections, putting far more load on the server. This takes correspondingly more power from at least a 500 MHz G4, but as I discovered, even with an EyeTV 410, the client and network can remain at 400 MHz G3 and 802.11b. If, like mine, the client computer is an elderly G3 400 MHz PowerBook with only 384 MB of RAM and a slow 802.11b network, a little more set- up is required. For slow computers, CyTV is able to transcode the stream by re-compressing video and audio data with slower rates than those EyeTV normally uses. Playback quality is lower, but at normal TV viewing distance picture quality is better than from a standard cathode ray tube TV. In addition, the EyeTV unit can record the TV program in high quality and stream it in lower quality over the network at the same time. CyTV’s Read Me file gives good advice on configuring transcoding settings. VLC software is powerful and capable of doing far more than watching streaming TV; for example, I use it to play Windows Media files. 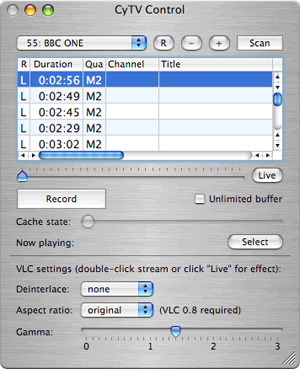 Only two controls are needed to use VLC with CyTV; one to set the TV picture to full screen, and the other to adjust volume in addition to the Mac’s normal sound setting. Both are keyboard- or menu-operated. The CyTV, VLC, and EyeTV trio are easy to live with and have given a completely new lease on life to my elderly laptop. I can watch TV at the limit of the wireless network, although more usually, the laptop lives in my kitchen acting as TV, cookbook, and Internet radio receiver. Once I discovered the best transcoding settings, I had few problems apart from an occasional reluctance of the client Mac to receive both the audio and video streams. Restarting CyTV client or refreshing the stream by clicking the Live button solves this. Sometimes I have to place my laptop physically next to my wireless router to start the TV stream correctly, and I have never been entirely successful at changing channels from the client Mac. The channels change but not to the one selected unless they are switched incrementally, one-by-one. With 70+ channels available, this becomes unacceptably slow. I have also noted that excessive noise in the TV show can make the audio become out of sync with the video, such as from racing car engines, seaside surf, or complex music. I think these problems are due to my old PowerBook being below the recommended minimum specifications. A recent upgrade of my wireless network to 802.11g solved other little annoyances and slowness logging into the streaming TV signal. Support from CyTV author Andreas Junghans is fast and effective. He responds to e-mails within 24 hours if not sooner. When Apple released Mac OSX 10.4, CyTV broke. Andreas rewrote the whole application within a couple of weeks and in the process added extra features and stability. He is currently rewriting CyTV to be compatible with the latest version of EyeTV released only days ago. For a free piece of software, CyTV cannot be beaten for value. It has never crashed on my Macs, is very easy to set up and use, and its hardware requirements are low. The few glitches I have had are all due, I am pretty sure, to my receiving Mac being so lowly and slow, but even that old laptop makes a good TV. When I was going to buy a new TV recently I hesitated and decided to cancel my order and keep using my old laptop instead. I am so pleased with CyTV I happily donated to Andreas’ retirement fund via the PayPal donation screen at his Web site. Copyright © 2006 Mark Tennent, mark@tennent.co.uk. Reviewing in ATPM is open to anyone. If you’re interested, write to us at reviews@atpm.com. It does not appear that a 2.1 Ghz G5 is enough horsepower to transcode HD streams (19.3 Mbs) on the fly. Have you heard of anyone who has been able to use CyTV with HD programming? The man to ask is Andreas, the developer of CyTV. Click on the link at the top of this page.